Mohandas K. Gandhi was a man of peace who spent most of his life preaching non-violence to gain equality and freedom for the people of India. This informative program explores his struggle against the mighty British Empire and her colonies of South Africa and India. It shows various historic events like the Dandi March and Non-Cooperative Movement that he initiated and led India to freedom from the British Empire. him to greatness as an African leader. Using never-before-seen footage of the President and his family at home we get a glimpse of Mandela’s love of life and the sparkle which has captured the heart of the world. 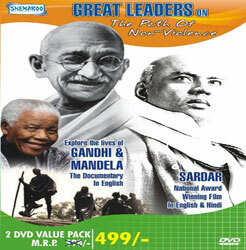 This Biographical epic on Sardar Patel concentrates largely on the last five years of Sardar’s life from 1945 to 1950 when he strode on the national scene, a key figure in wresting India’s Independence and integrating the nation. The film deals with all the myriad and debilitating problems that India faced in its pre and immediate post Independence period, which turned out to be Sardar Patel’s finest hour when problem after monumental problem was solved by Sardar Patel. This film is a tribute to the Sardar’s inestimable contribution to the making of Free India, a memory that can stead to face the problems of India today and tomorrow. 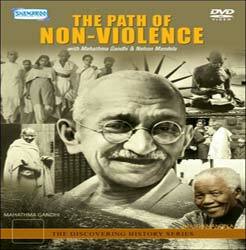 "‘Discovering History Series’ – Produced by ‘The American Institute of Education’. 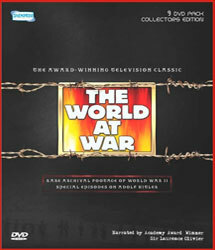 The World at War was first broadcast 31st October 1973, when memories of the Second World War were still clear in people's minds and the war's veterans numerous. This unique television series was able to assemble these recollections, together with archive footage into one of the most powerful and successful historical documentaries ever seen. The voices of those that fought, worked or watched during the Second World War gave each episode a vivid sense of what it was like to be there and was the hallmark of the series.